Despite the hype surrounding them, I have been skeptical about the potential of "wearables" as a mass market product category. Most of my analysis focuses on the primary use cases targeted by these devices, which still remain unclear. However, we haven't seen any data on sales that would give us an adequate understanding of market conditions. Of course, this is partially because these are still early days. That said, I thought it would be interesting to compare the early shipment performance of these devices with what we saw in the smartphone and tablet markets. The chart at the top of this post compares smartwatch shipments to smartphone and tablet shipments, starting from the quarter when each category was meaningfully conceived. Data on smartwatch shipments (from Strategy Analytics and ABI Research) is only available from 2013 to Q1 2014, so I've restricted the period to five quarters. Smartwatch shipments, excluding fitness trackers like FitBit, meaningfully began with the introduction of the Pebble in Q1 2013, followed by the Samsung Gear. Similarly, tablet shipments became meaningful with the introduction of the iPad in Q2 2010, followed by the Samsung Galaxy Tab range. I've restricted smartphone shipments to what I call "modern smartphones", i.e. the iPhone and early Android models, starting in Q2 2007. It must be pointed out that these figures represent shipments and not sales -- while this is usually of little consequence, high return rates for smartwatches could have a meaningful impact. The first observation from the chart is that early tablet shipments dwarfed those of modern smartphones and smartwatches. 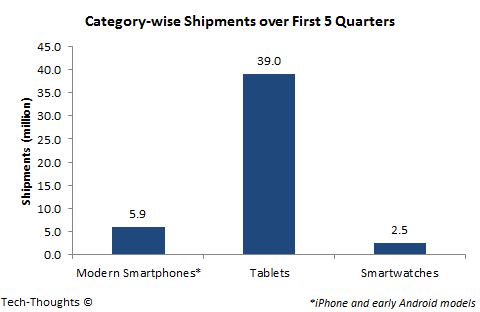 But even modern smartphone shipments more than doubled those of smartwatches. The smartphone-tablet dichotomy is fairly easy to explain. The iPhone and other modern smartphones relied on a completely new interaction model (capacitive touch and multitouch) which most consumers had never used before. In addition, this was in the "pre-appstore" era when software distribution was still unclear. By the time tablets were unveiled, both consumers and developers were comfortable with the interaction model and appstores, i.e. tablets had no real learning curve. In some ways, smartwatches have had the same advantages that tablets enjoyed. The interaction model doesn't seem drastically different (compared to the transition from keyboard/mouse to touch) and appstores are well established. They also benefited from Samsung's offer of a free Galaxy Gear with the Note 3 phablet. Despite these advantages, smartwatch shipments have remained well below those of early smartphones and tablets. While this analysis pre-dates both Android Wear and the Apple Watch, it still isn't very encouraging. In my opinion, OEMs and platform owners need to ask themselves some crucial questions -- 1) What are these devices for? What use cases do they target, and what problems do they solve for consumers?, and 2) If those use cases exist, what is best interaction model for them? Is it very different from the current paradigm?